If you think 3D printing is only good for making flimsy paperweights, then you're pretty much right. 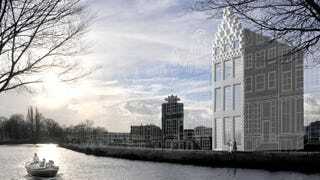 A group of audacious Dutch architects, however, have just begun 3D printing an entire canal house in Amsterdam. Is the first 3D printed house a gimmick? Definitely! Is it an experiment that pushes the possibilities for 3D printing technology and architecture ? Maybe! 3D Print Canal House is the brainchild of DUS Architects. "KamerMaker," Dutch for "room maker" is their giant printer custom built inside a shipping container. Just a few weeks ago, KamerMaker began printing plastic furniture and walls at an empty canal-side lot in northern Amsterdam. Smaller versions of the unusual honeycomb walls have been tested on normal desktop printers, and everyone just needed to be scaled up. Well, if only it were that easy. "The printer did not always manage to spread the [plastic] Macromelt evenly, making some of the ribs of the honeycomb structure of the block uneven," reported ARN to the surprise of no one who has used a 3D printer. But the architects remain optimistic. The first few printed blocks are meant to be test pieces as they improve the process. It takes about a week to print a 3-meter high block right now. The project's leaders hope to eventually get that down to two hours and finish the first of 12 rooms in a year, and the entire house in less than 3 years. Ultimately, 3D Print Canal House is an architectural research project, one that is very much being conducted in the public eye: you can actually buy tickets to visit the construction site for 2.50 Euros.